I know, everyone talks about letting go these days. I was talking about it LONG before it became in vogue. Let me share something with you that has absolutely changed my life. It is not new, but IT IS SOMETHING THAT WORKS and I believe it can change your life as well.The July 2007 Letting Go of Stuff tip is about admitting that you actually do have something you want to “let go of” or change in your life. I know LOTS of folks (and I bet you do too) who BELIEVE that only others have stuff. When they see the title of my book, the first thing they say is, “I know exactly who needs this…” and they often get it as a gift to give away – and that is a good thing. BUT WHAT ABOUT YOU? Perhaps you are in denial about your stuff. Only you know. 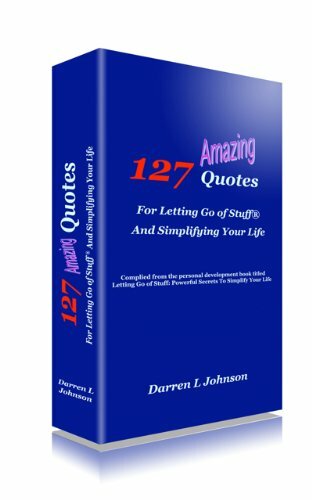 WHAT CHANGED MY LIFE is being able to accept that I, as the author of the book titled Letting Go of Stuff, have stuff too. YES! I have stuff. Everyone has stuff, something they want to change about themselves. The key is to ACCEPT AND ACKNOWLEDGE that you have stuff. Many are in denial. SO, how do you know when you have stuff and what can be done to get you to the point in which you accept it, so you can LET IT GO? Well first, we have to DEFINE STUFF in order to know whether we have it. Stuff is defined in my book (p. 2) as the intangible, random thoughts that keep you from being able to accomplish what you want in life. Guilt, shame, frustration, anger, dislikes for ones self, holding on to past events as if they happened today, and the like. That is stuff. Some of us live and flounder in stuff. Some of us have an innate ability to shake things off, and keep moving forward. Either way, we all have stuff and there is not avoiding that fact. A great question is, “how to we manage our stuff, and thus, let it go? Well, a part of letting go of stuff is in what we say to ourselves about our “stuff.” The internal conversation is key. Talking to your self is not a problem. The challenge is in what you say to your self. The MOST POWERFUL conversations you will ever have, are the ones you have with your SELF. That is the conversation that you will believe in the most, whether you realize it or not. That is the conversation that your subconscious reacts to, which leads to your overt actions. In chapter three (p. 35) of my book I quote the theologian Martin Luther. He is credited with saying, “Faith is permitting ourselves to be seized by the things we do not see.” He is not referring to he things we cannot see in the darkness, but the things we fail to recognize in the light. When a person is in denial of having stuff – they are living as a blind person. It is only when you begin to recognize and face your stuff, that you truly begin to see. Accepting and acknowledging that you have stuff is not a sign of weakness, but of strength. It is an indication of how much you truly love YOU. Do you love self? I know that for some of us, we have to overcome many internal conversations before we can even admit to loving ourselves. For example, part of the internal conversation that some people have to deal with before they can actually claim love for self is that loving one’s self is being too selfish. This kind of thinking can only lead to feelings of guilt, anguish, and frustration. The fact is that we are love, we were all created out of love, the Universe/God is love, so therefore loving one’s self is part of the natural order of things. This is why, when you don’t love yourself, there is so much anguish and feelings of frustration (among other things). You are going against the natural order of things when you don’t love YOU. Letting Go of Stuff™ is also about getting to know your self. When I coach people who are having relationship challenges, I don’t suggest that they work things out with their partner or spouse, I begin initially with looking inside of that person. You see, we have to first develop a relationship with SELF before we develop a relationship with anyone else. Here is the kicker – if you can’t get along with your self, then what makes you think you will get along with anyone else? Think about it. Take the time to examine your life and your stuff. What do you want to change, make better, and let go of? Use your courage to face your STUFF, acknowledge your STUFF, and then begin the process of Letting Go of Stuff.™ Begin today!! You owe it to your self AND you deserve it. so! Thanks, quite great post. this post was good. I don’t know who you are but definitely you’re going to a famous blogger if you aren’t already 😉 Cheers! wow, nice article…keep sharing about letting go and stuff. Thanks. Hi Carol and thanks for visiting the blog. also appreciate the most recent posted article by Michelle Rosado. We hope that you will consider, if you haven’t already, subscribing to the Letting Go Cafe. Either way, we are happy you dropped in. this article has changed my life, when i read it and followed it, i was also happy! Thanks for sharing Carol. I think that is awesome that the article had such a profound impact. I would be curious to know what aspect of the article moved you the most. Let me know. We’re a group of volunteers and opening a brand new scheme in our community. Your web site provided us with valuable information to work on. You’ve done an impressive activity and our entire community shall be thankful to you. I am happy to hear that your community has/will benefit from hanging out in the Letting Go Cafe. Come back again, or subscribe and you will know every time there is a post. Sometimes it is easier to “help” the world than to “share” with the world. My philosophy: how can you help someone else, if you cannot help yourself? For this I thank you for reminding me to always share my own intimacies (both positive and negative) with the world as I seek to help others find the paradise in their relationships. Your messages are always so timely and thought provoking. I look forward to hearing more from you as we continue to work together on our many endeavors to make this world a better place for us all. You are one of the most profound individuals I know. Thank you for being my mentor, my coach, my business and organizational developer, and most of all for being the truest of friends. Stay tuned as my husband, Mr. Intimacy, and I reveal our lives in the hopes of making a difference for other couples in pursuit of their own Intimate bliss. We promise to keep it REAL! How impactful that message is. It truly causes me to be REAL with myself and realize that I have more STUFF than I care to acknowledge. But it is what it is. You help me to see that to move forward, I have to accept what stuff I have and deal with it. It is truly a blessing that you can share about your life which encourages me to understand the things I read in the book. Please let me know when we can get together and discuss further. You’re awesome!!! Yes it’s me your ol’ Buddy “MacBeth.” It is truly wonderful and a blessing to have been able to observe over the years how The Creator has worked through you,”Letting Go of Stuff,” from your teen years. I have vivid memories from the time when we were teens of you saying, ” You just need to let go of stuff.” And then grin at me or whoever and say,” Yeah, stuff!” I think living through this as well as your training has truly made you a blessing to so many. I also know that this is the word that the Creator gave you before the foundations of the worlds as a gift to all those who have an ear to hear. Do what you do. Thank you for faithfully remaining “DJ”. Enjoy the journey my friend. See the 2012 In Review report for the Letting GO Cafe. You will really appreciate it. ourselves, and reframing this into God’s perspective. That’s truly affirming and liberating, though counter-cultural. Keep doing what you do so well…. I would love to get together and have a chat at your convenience.